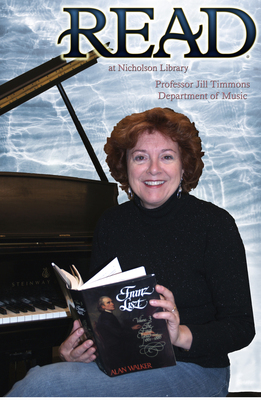 Jill Timmons, Professor of Music & Artist in Residence, reading Franz Liszt, Vol. 3: The Final Years, 1861-1886, by Alan Walker. Terry, Paula and Nicholson Library Staff, "Jill Timmons READ Poster" (2007). READ Poster Gallery. Image. Submission 8.